Google is a tool that the majority of us use every day. You may use Google to search for information such as videos, images, but did you know that Google is capable of a lot more? Google also has its fun side, and all the Google easter eggs and games that you can find in the search engine is proof of that. One thing to keep in mind is that the games you are going to find are not going to be jam packed with amazing graphics like in your favorite PS4 game. Even though they don’t have amazing graphics, they are still entertaining and fun. A game that will keep you entertained is Starcraft. To enjoy this game you only have to type in Zerg Rush and you will see how small Os will attack your search results. Act fast because if you let this O’s drop they are going to destroy all your search results. To defeat the O’s you need to click on them until they are gone. To completely destroy them you will need to click on them quite a few times, but you will still have enough time to destroy the other O’s if you act fast. There is always a story behind every Doole and Easter Egg Google creates, and this has it’s too. This game is about Blizzard’s Starcraft real-time strategy game. The O’s in the game represent the aliens in the series that attack in huge numbers. If you don’t feel like playing, you can always click on the clear button on the upper right-hand corner. Right above the clear button you can also see how many aliens you have killed. In my case, I didn’t kill many in my search results. I couldn’t leave out the classics and not include the Barrel Roll. Sure, it can make you dizzy, but it’s still fun to look at and make someone pretend they broke your computer. To make Google do a barrel roll, type in those words into the search bar. After, you will see it do a barrel role, but what search results do you get? When you type in Do a Barrel Roll, get results such as music for the barrel roll, the Urban dictionary definition of a barrel roll, among other things. You may be so used to how great today’s websites are designed that you probably don’t even remember what they looked like when they first started. 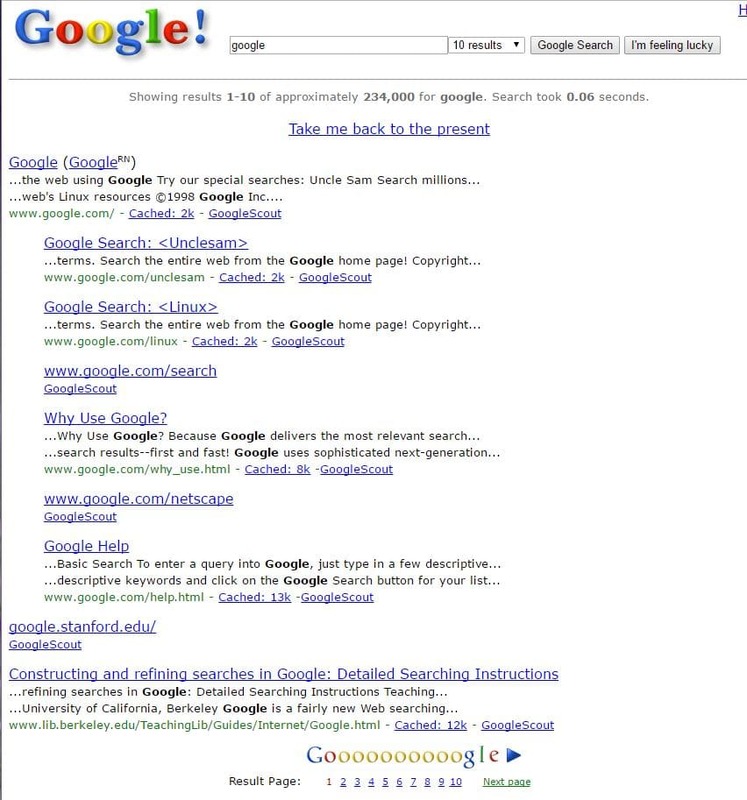 By typing Google in 1998, you will see what the search engine looked like back in the day. Another classic that couldn’t be left out is Pac-Man. If you ever showed this game to your kids, they would probably laugh in your face because of the simpleness of the game. To get started, just click where it says Insert Coin and use the arrows keys on your keyboard to move your Pac-Man around. Do you remember a game called Pong? That game where a tiny ball that bounces all over the place destroying the squares above it. To keep playing, you would need to move a long base to have the ball bounce back up. If you type in Atari Breakout and click on the first result, you can try this game out. This iconic 1976 game was in-part by Steve Wozniak and Steve Jobs. So if you ever want to pay tribute to Steve Jobs, you can always play this game. Learn how to play Atari Breakout games. You might be asking yourself what a Festivus pole is, right? Festivus is a parody and a secular holiday that is celebrated on December 23rd for those who don’t want to participate in commercialism and pressure of Christmas. To see what a Festivus Pole looks like, type Festivus into the search engine. You will get a long Festivus pole that goes all the way down to the end of the search results where you can see the base. By simply going to Google Maps you can locate the loch ness monster without leaving the comfort of your home. Go to Google Maps and in the search bar enter Loch Ness and the little man you usually drag will turn into the loch ness monster. I think I speak for everyone when I say that we hate it when we are on Google Chrome and that annoying message that tells us we have no Internet connection. If the world gives you lemons, make lemonade. By pressing the space bar when the dinosaur tells you that there is no Internet connection, you can make it Jump. The only thing that it is going to jump over are a bunch of cactuses, but it’s still fun to look at. I’m more of a dog persons myself (no offense to cat lovers) and I think other dog lovers will like this surprise as well. 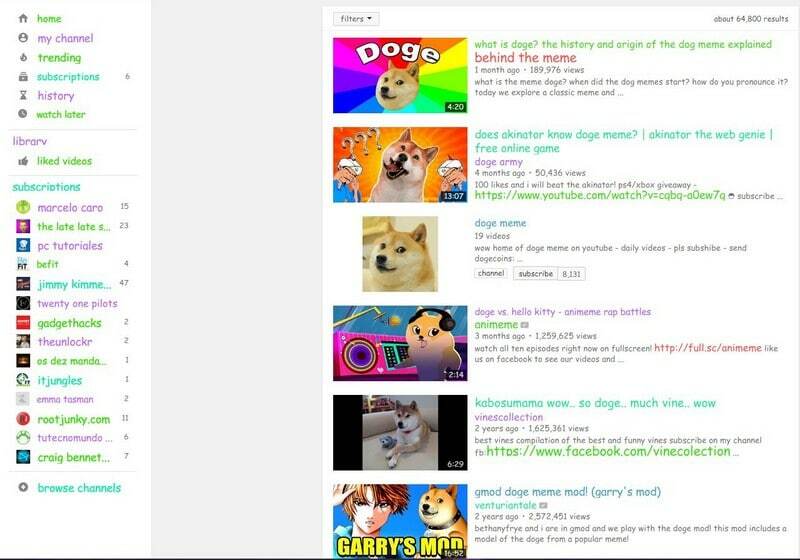 If you go to YouTube and type in Doge Meme in the search bar, you will get quite the surprise. You will see your entire YouTube page has a lot more color than before. Every text that you see will be a different color, but don’t worry this goes away once you search for something else. We have all misspelled something when searching for something on Google. Well, Google decided to make fun of its own ¨did you mean¨ suggestion by placing the words ¨Did you mean¨ even though there is no mistake in the spelling of recursion. Just in case you are wondering what recursion means, it’s a method of defining a sequence of objects such as a function, an expression or set, where some number of initial objects are given, and each successive object is defined regarding the preceding objects. Only people that have at least seen The Lord of The Rings: The Fellowship of the Ring will understand this one. If you go to Google Maps and get walking directions from The Shire or Rivendell to Mordor, you will get a small surprise. You will not only get the walking directions, but you will also get a warning. What does the warning say? You’ll have to try it out to find out. The best roll I think Chuck Norris was in is his part in Walker, Texas Ranger. For you lads who have no clue what I’m talking about, it was a show that aired from 1993-2001. As the name clearly states Chuck Norris played a Texas Ranger named Walker. 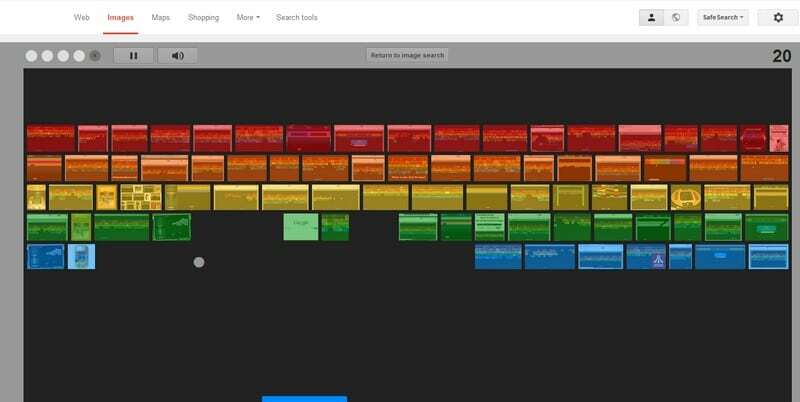 Google continues to pay tribute to him with this Google easter egg. To try this trick out type in the Google search bar, ¨Find Chuck Norris¨. 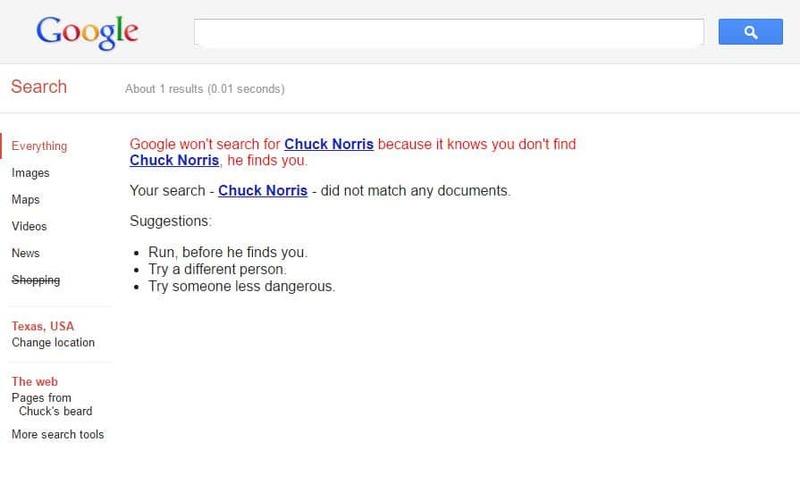 You will see how Google tells you that Google can’t search for Chuck Norris because Chuck Norris finds you. After laughing for like half an hour, I tried it again. A great trick to try. You feel like playing your favorite board game to remember the good old days, but the dice are missing. You’re probably the first persons to lose them, but you can still play by typing in Roll the die in Google Search. If you are a Star Wars fan (who isn’t, right? ), then you are going to love this Google Easter Egg. To see if the force is with you, go to YouTube and in the search bar type in Use the Force, Luke. You will automatically see the results move as if you were high on medication. Use the force (or your mouse cursor) and move it up, down or side to side. The YouTube search results will follow wherever you move the cursor. It is a great trick to try out if you want to impress your friends. Type blink HTML to see how the results will start blinking at you. Kevin Bacon will always be remembered for his role in Footloose. The movie has left such a mark that if you type a celebrities name followed by the words bacon number, you will know how connected that celebrity is to Kevin Bacon. For example, if you type in Kevin Bacon Bacon number you will get a 0. If you type in Rick Moranis’s Bacon number, you will get a two. Ask Google to Flip a coin and it will. You can flip the coin as many times as you want to. Super Mario Money – Type in Super Mario money and towards your right you are going to see the typical question mark where Mario got his mushrooms. Click on the question mark and see how it throws a coin in the air. Play Tic Tac Toe – Type in Tic Tac Toe and play the once popular game again. Sure, it’s nothing like the games you play today, but if you have a few minutes to kill, this will certainly keep you entertained. Solitaire – Another game you can play to kill some time is solitaire. Type in the name of the game and set how hard you want the game to be. Spin the Dreidel – This dreidel is not made out of clay, but the digital version is just as good. Type play dreidle and watch it spin. You can spin it as many times as you want. Start Spinning! Once in a Blue Moon – You’ve probably used the phrase once in a blue moon, right? But have you ever stopped to wonder when that actually is? Google knows. Type in once in a blue moon to find out. Metronome – If you ever need one for some reason, Google has got you covered. Type metronome and have access to your very own metronome. You can adjust the beats to your liking, and you can even set it all the way up to 208 beats per minute. Google not only works hard to keep things up and running, but it also knows how to have fun. Proof of that are all the Google Easter Eggs and Games that are hidden in the browser. Did I miss any you try out? Let me know in the comments.